CTT delivers the eminent global industry and subject matter consultancy expertise in the highly specialised field of Trade Finance and Treasury Management and provides value added advice for the B2B network and Banking space and to other parties involved in international commerce. We help develop sustainable growth strategies and business models as well as execution plans. We focus on client, solution, people, technology, partnership, connectivity and digitization strategies and roadmaps and at request, we will also help drive the implementation and rollout of these strategies. Sustainable success for every institution, whether government or privately owned, is based on a well articulated vision and strategy which needs to be clearly communicated to their communities (clients, employees, investors, partners, regulators, shareholders). Is there a clear vision and purpose for the business? What is the value of the target market and the geographic coverage? Is the business model well articulated and thought through? What are the value points of the products and solutions sets and what pricing strategies work best for the clients? Are they clear, simple and believable by all levels of the organisation, by all partner organisations and by all stakeholders? What are the resources required to execute? People? Technology? Partners? Frameworks? Policies? Governance? Balance Sheet? Investments? Management structure? Every business or institution is dependent on its depth of talent and access to an experienced resourcing pool to optimize its impact. What people strategies and frameworks need to be in place to lead and inspire the staff to achieve and exceed the goals and objectives of the institution? Motivated people who believe in the organization’s vision, strategy and execution will go the extra mile and will provide superior client service that promotes client loyalties and fosters a culture that delivers sustainable results. Standing still or Status Quo is a death penalty to any business or institution. Change is inevitable. Managing Change successfully is an activity that requires specific focus and attention. People that understand and believe in the Change vision will execute it successfully. CTT draws on first hand experience in the creation, communication and execution of these activities to address the Why? and What? Questions and offers insights, contacts and output that delivers tangible results. How to successfully build a sustainable Trade Finance and/or Transaction Services business while addressing the right client needs with superior products and services and generating growth and results to its owners and stakeholders? It is essential to establish the right business frameworks throughout the Organization with an Operating Plan that is addressing all critical aspects of the Strategy execution with clear roles and responsibilities and a transparent governance connecting all functions effectively. Superior client and partner interaction is achieved by providing the right data to the right people at the right time. Therefore, pro-active Data & Information Management is essential in order to equip all client interacting functions with the right data points available 24/7 and real time. Every business or institution has to demonstrate that its Compliance and Risk Management functions are constantly upgraded in order to execute its mandate within the emerging law, policies and regulation in order to satisfy all stakeholders, particularly in the AML area. New frameworks, governance structures, check and control points, escalation paths and reporting requirements must be put in place. Given the complexity around and the increase of the regulatory capital charge on the Trade Finance and Transaction Services business, it is important to manage the deployed capital pro-actively. This includes getting the right financial metrics such as PD, LGD, EAD etc. to support the decision making process and to have a pro-active approach to the management of and the distribution of the assets using more sophisticated structured solutions to improve the ROE. CTT is uniquely positioned to provide business advice in these activity fields to address the “HOW?” question and offers insights, contacts and output that delivers tangible results to business leaders, risk and compliance managers, technology teams, regulators & treasurers in the Transaction Banking Industry. People are the key ingredient to any successful business organization. What does it take to attract and keep the right people and have the right people in the right positions? CTT offers services to companies, banks, regulators and industry associations in the Trade Finance and Transaction Services Industry that are competing for the specialised talents in a small talent pool. The goal here is to help with resourcing gap analysis, performance bench marking and developing people strategies that help these institutions to access top talents to fill their key senior positions and to provide multi-year succession plans. CTT offers service to individuals that work in the Trade Finance & Transaction Services Industry around the world. The goal is to provide pro-active advice to senior managers to progress in their careers and to achieve a sustainable work life balance with focus on Health, Nutrition and Sport activities. A career is comparable to a marathon, not a sprint. Every manager needs to develop individual strategies suitable to his/her life style to successfully go through the marathon and adopt strategies that work for him or her. Successful people have managed to balance their work/life activities with clear focus on health, nutrition and sport activities with a personalized service that guarantees progress and sustainable results. CTT is uniquely positioned to provide Talent Optimization Advice to address the “WHO?” question and offers insights, contacts and connections to Institutions and Individuals through a large network of global contacts in the Transaction Banking Industry. CTT is at the forefront of the digitalisation of the Trade Finance space and has published a white paper in September 2016 with the title: Digital Trade Finance – The Reality. The vision is to help develop strategies to build digital eco-systems that connect parties in international trade (buyers, sellers, service providers, financiers, credit underwriters, payment networks, banks, carriers, logistics companies, customer and port authorities etc) to facilitate the commercial contract settlement process thus helping these parties to strengthen and connect their processes rusting in cash-flow and working capital improvement, whilst increasing efficiency, quality, security and management control.CTT in this space, Bolero and PrimeRevenue, are ideally positioned to upgrade its solutions and/or connect with the right parties and partners to create seamless trade finance settlement and financing solutions. CTT with its large contact network of established and new players is associated with various existing companies and institutions and involved with various new emerging players and start-ups. With his non-executive Board assignments as Chairman of the Board of Bolero and as Director of Trade.IX, the owner of CTT is driving pro-actively the strategic focus of these two trade platforms. Bolero is constantly developing its solution sets to complement its current offering by connecting all parties involved in the commercial contract settlement space to create value added and unique solutions sets. 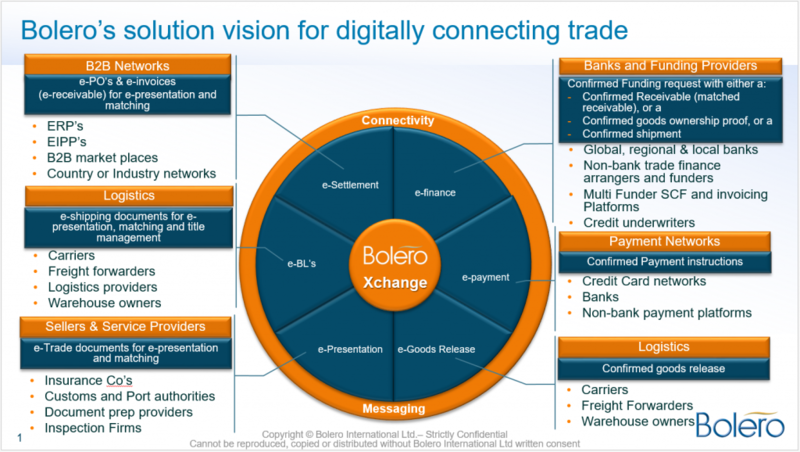 Have a look at Bolero’s solution vision for digitally connecting trade. For more information please contact CTT or Bolero directly. Trade.IX is a supplier / seller centric invoice discounting multi-funder platform leveraging the distributed ledger technology and the insurance capacity of a large Credit Insurer. It connects B2B networks and large corporates with funders and credit-underwriters offering a seamless finance experience including the trade and settlement payment. Trade.IX is incorporated in Ireland and will formally launch in Q1 2017 with a single client and in Q2 with a B2B network. The focus at the beginning will be on the European markets, however, global is in scope. Trade.IX will forge partnerships with a reputed technology company, a proven payment network and an established credit underwriter to deliver its seemless finance experience. Trade.IX is an aggregator that offers frictionless finance channels for Corporate clients and B2B networks into the funding world through its flexible multi-funding platform. more information please contact CTT or Trade.IX directly. CTT is providing transactional trade finance services through its partner companies Trade.IX and Finanz AG. The arranging of the right short, medium, or long term Traditional, Supply Chain or Specialised Trade Finance structures and solutions are key techniques for Corporates to finance their commercial activities and ensure that enough Working Capital is available at every corner of the company at any time during the operating cycle. CTT’s unique experience in this field, its partners, its global network of trade finance professionals and its involvement in the Digital Trade Finance space position CTT ideally as a competent partner to raise Trade Financing and to leverage existing and emerging trade finance techniques and solutions. Finanz AG Zurich is a Swiss based finance company providing specialized financial services and advisory in select Emerging Markets for both corporates as well as financial institutions. The company focuses on a range of activities including debt arranging, forfaiting, transferability & convertibility solutions, distressed debt, countertrade and structured trade advisory by arranging short, medium, or long term trade financing with access to a wide network of investors. With offices in Zurich, London, Buenos Aires, São Paulo, Santiago de Chile, Mexico City and Singapore, Finanz AG has the local experience and expertise in handling complex financial transactions and providing tailor-made solutions. Specializing in risk distribution, Finanz AG also advises regional and local Financial Institutions as well as large corporations in establishing Risk Distribution desks, including best practice in risk mitigation and syndication of assets. Finanz AG complements your existing bank relationships beyond the traditional / off-the-shelf products by providing tailor-made financial solutions in key markets / regions to facilitate your cross border dealings. Do you experience difficulties obtaining risk cover for exports into specific markets, do you have trapped cash overseas, or need advice how to lay off risk and improve your working capital cycle ? Please get in touch. For more information please contact CTT or Trade.IX or Finanz AG directly.